13 hours, 55 minutes left! Where do I use my Beauty Base voucher code? Discover a huge range of celebrity, oud and alcohol-free fragrances for men and women from huge designer names like Dolce & Gabbana, Gucci, Prada, Valentino, Viktor and Rolf, Giorgio Armani, Jimmy Choo, Roberto Cavalli and many more. You can also discover a huge range of makeup including foundation, blusher, bronzer, CC and BB cream, concealer, contour, finish and setting spray, highlighter, primer, eyeliner, eyebrow products, eyeshadow, mascara, lipstick, lip balm, lip pencil, lip gloss and much more. Beauty Base also stocks a plethora of skin care products including moisturiser, face and body wash, face masks, cream, oils, cleanser, exfoliator, body lotion, soap, hair removal products and tanning products. If you’re looking for hair care products you’ll also find a huge array of this at Beauty Base with a huge selection of shampoo, conditioner, hair masks, hairspray, hair mist and treatments as well as nail polish and hand cream for those of you who take pride in your nail care. All of the beauty ranges available at Beauty Base are available in vegan and cruelty-free options so you can rest assured that you’re buying from an ethical brand that cares about the planet. Makeup accessories are essentials in your kit but can often add up in price the more you buy. Save money on your beauty accessories but ensure you’re always stocked up with affordable beauty essentials at Beauty Base. Shop for eyelashes and eyelash extensions, eyelash curlers, eyelash glue, makeup brushes, makeup sponges, brush cleaners, tweezers, perfume pods, scissors, clippers and nippers, manicure and pedicure accessories, brushes, combs, hair bands and clips and pins. All these accessories come from huge brands like Milani, Real Techniques and J-Lash and often come with huge discounts and offers. If you’re looking for discounted beauty products and cosmetics check out the sale section at Beauty Base. Here you’ll find discounted fragrance, makeup, skincare, haircare, nail care and accessories from huge brands like Balmain, Bomb Cosmetics, Burberry, Calvin Klein, Clinique, Diesel, Elizabeth Arden, Estee Lauder, Gillette, Guest, Marc Jacobs, Hugo Boss, Kim Kardashian, L’Oreal, Lancome and many more. Shop by department and price to find your ideal product and save up to 50% off a range of designer beauty products that you’ll love. You will be sent a tracking number with an automated email once goods are dispatched. Please use this reference on the Royal Mail track and trace service. Please email Beauty Base a soon as possible should you wish to cancel your order. To contact them please email online@beautybase.com or call 0208 963 5947. In the event, your order has already been dispatched it will be your duty to return the goods. Can I use a gift voucher in-store? Currently, gift vouchers can only be redeemed online and cannot be exchanged for cash. Beauty Base is the UK’s favourite official stockists for designer fragrances and beauty products. 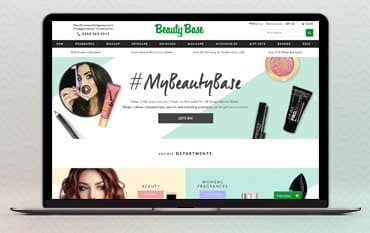 A one-stop destination for all your beauty needs with makeup, skincare, nail care, perfumes and even fragrance gift sets for both men and women, you’re truly spoilt for choice at Beauty Base. Shop online for designer cosmetics, perfume and aftershave and use a discount code from us at the checkout to save money on your order. You can also enjoy low costs with student discount, free samples competitions and a great sale section.